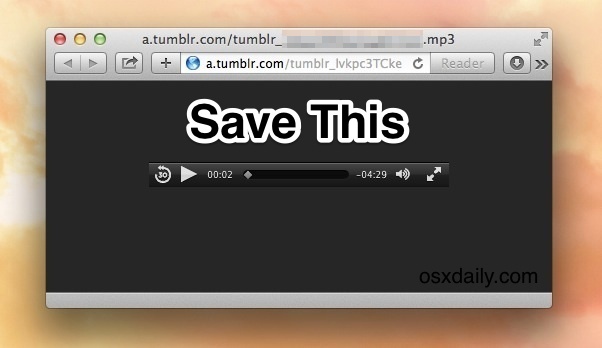 Many Safari users have noticed that when trying to save a raw audio file or video file that is loaded directly from the web within Safaris media viewer tab or window, the “Save As” default option will bring about a ‘.webarchive’ file – not exactly the multimedia file that users are looking to save. This has led some users to believe that Safari doesn’t support downloading of mp3, m4a, mpg, mov, and other files, but that is not the case. There’s two easy solutions to this nuisance, both of which will allow you to actually save the media document to your local hard drive from a media viewing window in Safari. While this works in all versions of Mac OS X and just about all versions of Safari, at the moment this doesn’t work in iOS, so iPad and iPhone users will need to rely on another option to save audio/video to their devices. I know you’re thinking “Page Source? Isn’t that for saving source code and used by developers?” Well, no not always, in this case “page source” is the actual media file, like an mp3 or m4a document. 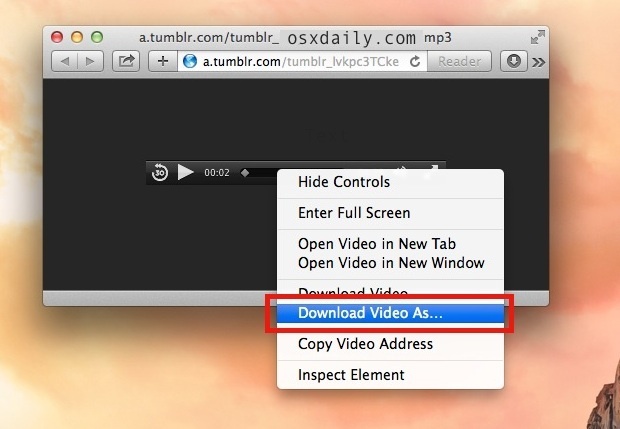 If for some reason you can’t get that to work, you can use option 2 which directly downloads the video file (or audio) as it’s loaded within a browser tab or window. Now just save the file as normal, putting it somewhere you can easily find. The default location will be the ~/Downloads/ folder that Safari will choose. Either trick works, so if you’ve been frustrated by the ‘webarchive’ files saving rather than the music or movie files in familiar formats that you intended to download, that’s all you need to do. It’s also worth remembering that you can always use the OS X encoder tools to convert the media file format to something else later, like a ringtone, if you decide that the file type you downloaded isn’t what you’d rather be working with. I’ve always thought that was frustrating with Safari. You can also download media through the Activity Monitor (or at least you used to) but what’s the point when you can use Firefox or Safari? Save As saves the file you expected to download every time with either other browser. No tweaking necessary. I’m sorry I must not be understanding correctly. Media Player Tab? I have not seen this, how do I open this tab? Thankyou. Or just put the cursor in the URL bar (Command-L), hold down the Option key, and press the Return key. Ooh that’s a good one, thanks DCJ001! 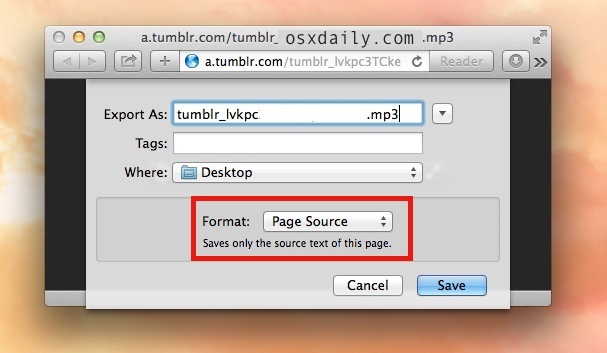 A tip like this should have example audio and video files on the page to actually try the tip.